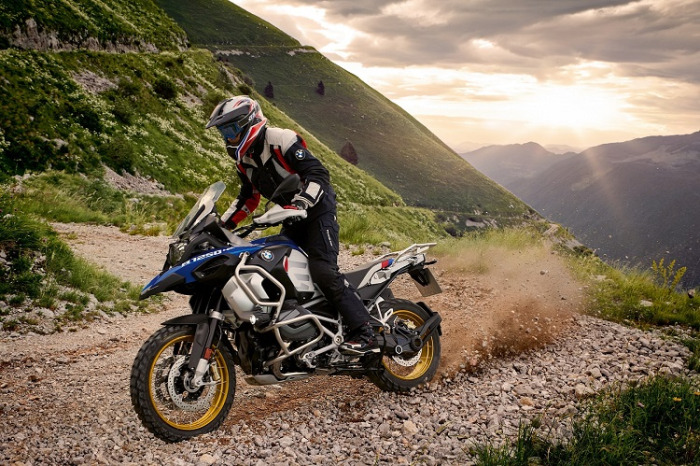 • BMW R 1250 GS embodies a unique combination of touring and long distance suitability with off-road capability. 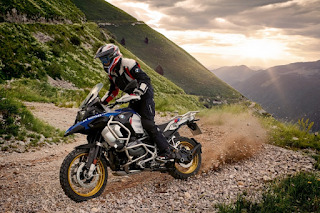 • BMW R 1250 GS Adventure offers excellent off-road and adventure prowess. • Introducing new BMW ShiftCam Technology for the ultimate riding experience. BMW Motorrad has launched the all-new BMW R 1250 GS and the all-new BMW R 1250 GS Adventure today in India. The all-new BMW R 1250 GS and the all-new BMW R 1250 GS Adventure will be available as completely built-up units (CBU) and can be booked at BMW Motorrad dealerships from today onwards. *Price prevailing at the time of invoicing will be applicable. Delivery will be made on ex-showroom. Ex-showroom price (inclusive of GST) (incl compensation cess) as applicable but excludes Road Tax, RTO statutory taxes/fees, other local tax/cess levies and insurance. Prices and options are subject to change without prior notice. For further information, please contact your local authorized BMW Motorrad Dealer. The all-new BMW R 1250 GS is available in Black Storm Metallic and Cosmic Blue Metallic paintwork. In addition, Style HP emphasizes the sporty side of the motorcycle featuring Motorsport colours Light White Uni/Racing Blue Metallic/Racing Red Uni. It also provides Black Powertrain, Rallye Seat Bench Low and Cross Spoke Wheels. Style Exclusive attracts connoisseurs and impresses with its intrinsic self-confidence. It features Black Storm Metallic/Night Black Matt paintwork and includes Black Powertrain. The all-new R 1250 GS Adventure is available in Ice Grey paintwork. Style HP features Motorsport Colours - Light White Uni/Racing Blue Metallic/Racing Red Uni. and Rallye Seat Bench Low. Style Exclusive features Kalamata Metallic Matt paintwork. The all-new BMW R 1250 GS and the all-new BMW R 1250 GS Adventure. The design of the all-new BMW R 1250 GS and the all-new BMW R 1250 GS Adventure coveys pure robustness. It is authentic and purely GS. The unmistakable flyline makes it clear that they belong to the BMW Motorrad GS family. The all-new BMW R 1250 GS has a pronounced modern appearance. Striking elements like mainframe, handlebar and drivetrain in silver attain a high level of visual quality. The luggage bridge in White Aluminium matt with trim holder in Nürburg Silver complete the dynamic look. The fork slider tubes anodized in gold emphasise off-road talents. The fuel tank side trim elements in Asphalt Grey metallic provide a touch of distinction. The all- new BMW R 1250 GS Adventure has a powerful and masculine look. Numerous elements in black like cross-spoke wheels, brake calipers and a main frame, together with the black coated powertrain create a very homogeneous appearance. The main frame in Aluminium Silver metallic matt and silver-coloured handlebars create a fascinating contrast. The driving dynamics and off-road qualities are highlighted by hand protectors in black along with the red and black seat. The new LED headlight gives the front view an especially striking visual appeal. Both in low-beam and high-beam lighting, the illumination is wider and more homogeneous. The large windscreen offers high comfort for the head, neck and shoulders as well as weather protection in every riding situation. The radiator trim in galvanised plastic adds a quality accentuation, as does the 1250 inscription. Standard adjustability of the seat height is available as before. Both models feature the powerful 2-cylinder in-line Boxer engine with a displacement of 1254cc, producing a power output of 100 kW (136 hp) at 7,750 rpm for dynamic performance, generating a maximum torque of 143 Nm at 6,250 rpm. The presence of a new power unit is demonstrated by means of newly designed cylinder head covers bearing the inscription ‘ShiftCam’ as well as the pipe ducting of the new exhaust manifold system. The variable camshaft control BMW ShiftCam is an entirely new technology which provides supreme ridability along with an additional increase in power across the entire engine speed range, reduced emission and fuel consumption levels, optimised running smoothness and refinement. Riders of the all-new BMW R 1250 GS and the all-new BMW R 1250 GS Adventure have two riding modes available as standard in order to be able to adapt the motorcycle to individual rider preferences. The standard Automatic Stability Control ASC ensures a high level of riding safety due to the best possible traction. The set-off assistant Hill Start Control is likewise a standard feature in both models, enabling convenient set-off on slopes. Relaxed tours, demanding off-road use or dynamic elegance, all standard packages offered on both motorcycles are incredibly versatile. The Comfort Package gives added riding enjoyment and safety. It consists of chrome-plated exhaust system, heated grips and RDC tyre pressure control. Touring Package gives the feeling of Boxer all day long. It comprises of Dynamic ESA, Keyless Ride, preparation for navigation unit, cruise control, centre stand, case holders on both left and right sides. Dynamic Package presents signs of sporting character, both visually and functionally. The Riding modes Pro (including ABS Pro, HSC Pro, DTC and DBC) support riding style on any surface and ensure more agility. The package includes Gear Shift Assistant Pro, Daytime Riding Light and LED turn indicators. Pushing boundaries is part of the BMW DNA. Both motorcycles are equipped with a completely new instrument cluster design, consisting an analogue speedometer and multifunctional display. Fast and clear information is available with the optional equipment known as Connectivity, with a 6.5 inch full-colour TFT display. Integrating operation via the BMW Motorrad multi-controller, it gives the rider quick access to vehicle and connectivity functions. Phone and media functions can be used without having to install an app. The rider can easily make telephone calls and enjoy listening to music with Bluetooth connection. In addition, the BMW Motorrad Connected app offers everyday-suitable and practice-oriented arrow navigation directly via the TFT display.